I got a friend request on Facebook yesterday from "Injinji Footwear." Does anyone else see a problem with this? Vibram FF stands for Five Fingers and also Four Fingers. I am sure when you order it online, there is a drop down that asks for number of toes. Looks like a potential discrimination lawsuit for Injinji. Ha! The Opressed conjoined Toe vs. Injinji. 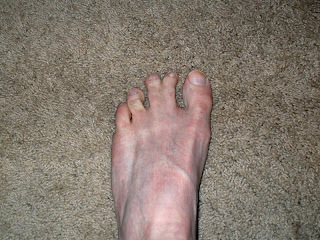 I think Injinji has an Equal Opertunity sock, well unless the big toe is connected.